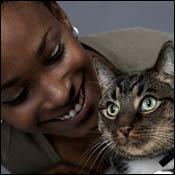 Pet owners love to boast about the cleverness of their furry companions. Dog and cat lovers, in particular, seem to relish unending debates over which animal is "smarter." Dog owners often cap their arguments with the fact that dogs have the ability to perform tricks, while cat people counter with the claim that their pets are too intelligent to perform on command. In truth, such methods of pet comparison are futile animal-world versions of mixing apples and oranges. Dogs are pack animals, motivated by a strong need to follow and please the pack's "top" dog (or a human master) in order to receive praise. The solitary cat answers to no one and is motivated by the need to survive. And while trainability may not be the feline's forte, cleverness and adaptability certainly are. Incredibly resourceful and self-reliant, the species has survived thousands of years in radically different environments and living conditions. Even domestic cats will show a crafty, strong-willed and versatile nature. Many of the cat's remarkable mental and physical abilities are dismissed as simply instinctive. However, just as humans are born with innate communication skills but must learn over time to master a language, cats refine many of their inborn abilities through practice. The widely-held belief that they learn through observation and imitation of their mother or other cats is now being called into question. Cats do learn, but in a different way than do humans or dogs; they have a special kind of intelligence. Once attained, even if by accident or trial and error, most knowledge is retained for life, thanks to the cat's excellent memory. Even hunting techniques buried under years of neglect in the well-fed house cat's brain will be recalled with ease should the feline, for some reason, ever have to fend for itself. Easily frightened, a cat will retain very strong memories of any incident that it considers threatening. All it takes is one face-to-face encounter with a growling dog to convince a feline that the entire canine species is best avoided forever. However, positive experiences are just as easily stored and recalled, particularly if they have to do with food or play. As any cat owner knows, domestic felines respond well to familiar sounds, such as can openers, the rattling of their dry-food bags or the crinkly noise of a favorite toy. Many of them also have an uncanny ability to know the hour of their regular breakfast time, waking up their owner if he or she tries to sleep in. As the feline psyche has become better understood, animal handlers have had more success in training felines to perform in film and television, once the exclusive domain of the dog. Although they won't perform for pats on the head and "good-cat" praise from their owners, some felines, if properly motivated, can be trained to do a wide variety of tricks, from opening doors and jumping through hoops to turning on lights. In what psychologists call operant conditioning, a cat will repeat a behavior for a food reward. This is best achieved if the desired behavior is fun for the cat, even more so if the person doing the training is its usual food provider. More amenable to rewards of food than domestic felines, large wildcats such as lions and tigers have performed in circuses for centuries. Sadly, there were times when unspeakably cruel punishment was used interchangeably with rewards of fresh meat to "tame" these unpredictable and potentially dangerous wild felines into performing desired tricks.